The Logitech G Pro Wireless is a fantastic mouse, it’s ridiculously light at 80 grams, it has insane battery life, has a great shape and the sensor is flawless. If you’re willing to spend top dollar for an ambidextrous or wireless mouse this is it, it’s an end game mouse. The Logitech G Pro Wireless is our #2 pick on the best mouse list coming second only to the Rival 600 due to the Logitech’s super high price point. 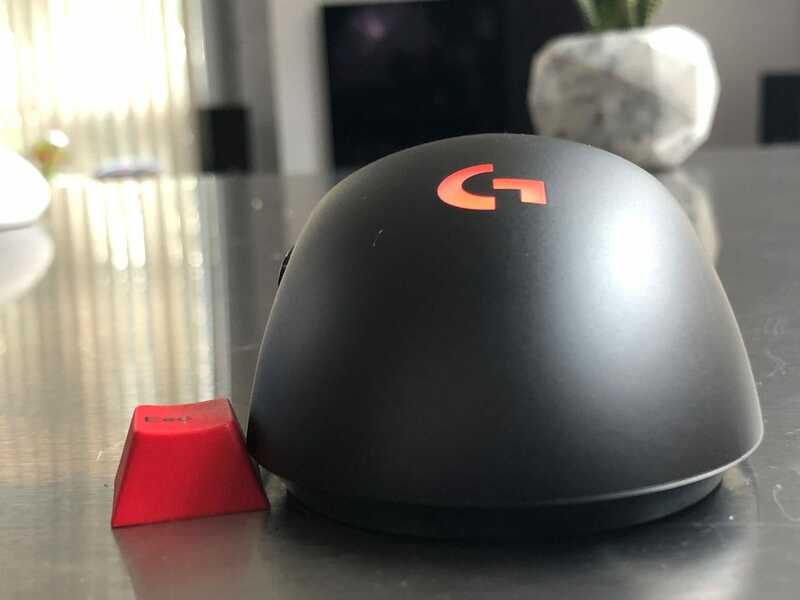 The G Pro Wireless is worth the money if you can swing the budget, the combination of weight, shape and battery life in a wireless mouse is unmatched, on top of that, it still has great buttons and a flawless sensor. The G Pro Wireless is a safe ambidextrous mouse with no distinct quirks to its shape, the closest comparison in shape would be the Nixeus Revel. It’s a firmly medium sized mouse sitting between the Rival 600 and Logitech G305 sizes. On first use this mouse was instantly familiar to me, the shape is similar to the Zowie FK2 , the Logitech G Pro Wireless is a little rounder and taller filling up the hand a little bit more and slopes down less in the front with a more gradual angle on the sides of the mouse. The G Pro Wireless measures in at 12.5cm in height, 6.35cm in width with a 4cm height. It’s an extremely comfortable mouse for someone with medium sized hands and I’d think that this mouse would suit a large portion of gamers hands and grips, I have no problem with palming or claw gripping this mouse. The shape of the mouse is great but I can see why people would prefer the FK2 with slopier sides or an ergonomic mouse like the G703 that fits in the hand more like a glove. The shape in combination with the ridiculous light weight of 80 grams makes this mouse a very easy mouse to maneuver, picking up and re-positioning with no issue. I had several longer gaming sessions over the Labour Day weekend and had no issues with fatigue or cramping. You can definitely tell this mouse with designed in coordination with pro gamers as Logitech proudly advertises. The outside material is a matte plastic which Logitech touts as being only 1mm thick. 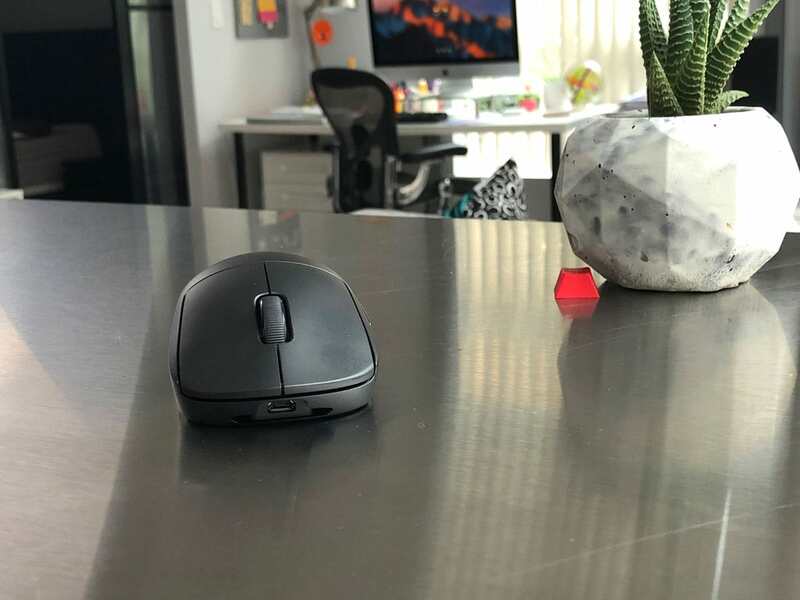 The 1mm shell still holds up very nicely, no apparent flex when squeeze and the matte coating on the mouse so far has proven comfortable and durable. No obvious rattles or vibrations when tapping and shaking the mouse, it looks to be solidly built. 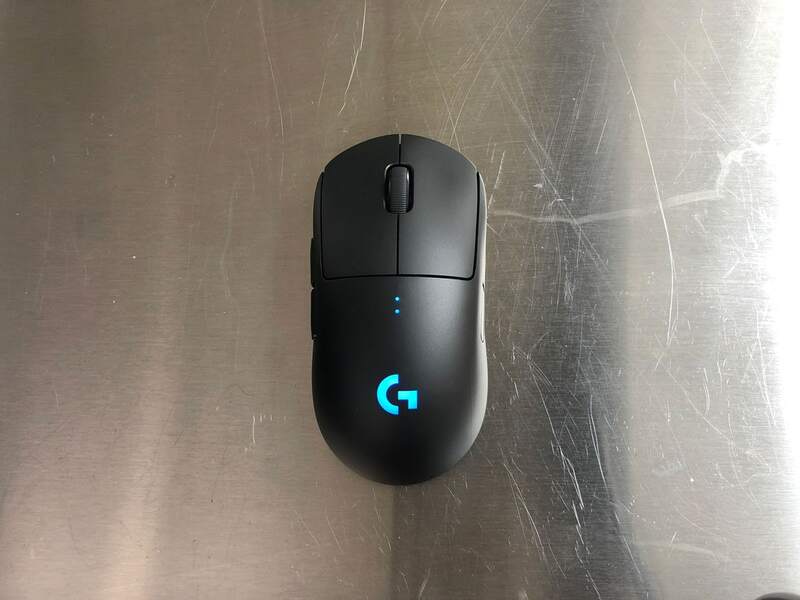 The bottom of the mouse features 4 feet, with 1 large strip at the front and 3 medium sized feet at the back, I’m not sure if it’s because of the light weight, but I found the G Pro Wireless a lot faster and slicker in comparison to the G703 and G903. Regardless, the feet slide well and is not overly noisy on my control Zowie mouse pad. There’s not much to say about the aesthetic of the mouse, it doesn’t scream gamer, it only comes in black and it’s the purest form of a all business pro gaming mouse. 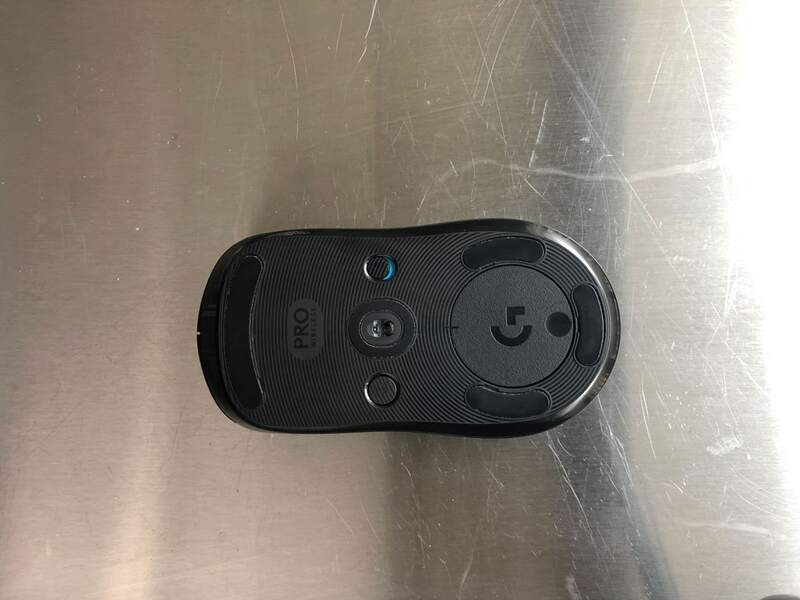 The Logitech G Pro Wireless comes with an updated version of the sensor found in the G305, the HERO 16K, we really liked the sensor in the G305 and this new sensor is looking equally as promising. From our testing, the HERO 16K tracks as well and as accurately as the top tier PMW3360 meaning no spinning out, no acceleration and prediction, from our testing it looks like Logitech has come up with another flawless sensor. The sensor itself tracks accurately up to 16000 DPI down to 100 DPI. Lift off distance is low, with no ability to adjust LOD in the Logitech software. What sets this mouse apart and what makes this sensor potentially worth the price, is that it does all of this while drawing significantly less power than the PMW3360 family of sensors, which dramatically improves wireless battery life. The great sensor, in combination with shape and ridiculously light 80 grams of weight makes this mouse one of the best performers I’ve come across, it’s a fantastic performance mouse. As with all Logitech mice, the wireless is lag free with the same thick braided charging cord, it’s kind of shocking that we’re now have lag free wireless mouse as the norm, woo 2018! The Logitech G Pro wireless has taken a queue from the G903 and features removable side buttons to accommodate for all types of play styles. The magnets on the Logitech G Pro Wireless secure the side buttons in place, you wouldn’t know that they were removable, they have a great feel to them, are well positioned and are easily accessible. 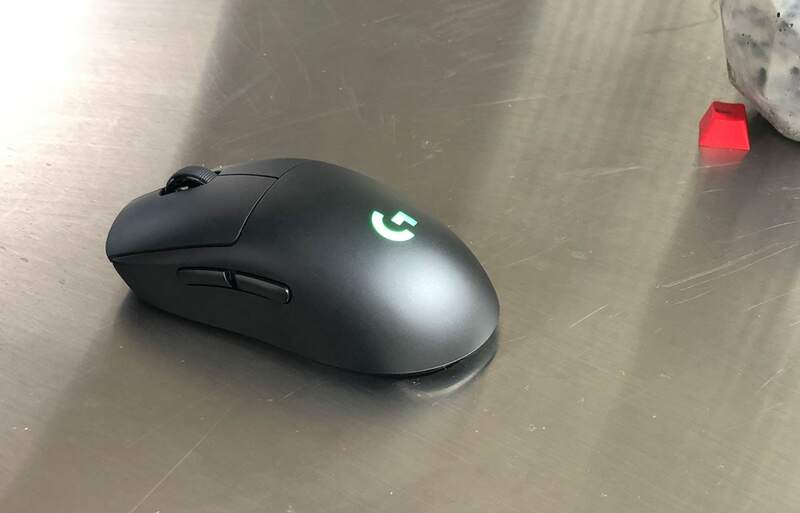 The primary clicks are 50 million click rated Omron switches for the primary buttons, the tensioning system in this mouse is done well as per usual for Logitech mice, the tactility and response of the primary buttons are sharp, but not as tactile as the G305. I’d put these clicks as a close 2nd tier to the Rival 600 and G305. The main buttons have a very safe slight groove into them, not supremely comfortable but not jarring to use either. The scroll wheel is solid, quiet with tactile steps, though the steps when compared to the G305 are a little lighter, I prefer a bit stiffer of a scroll wheel but didn’t have any trouble swapping through weapons with it when needed. The middle click itself is more tactile than the G305, nice and crisp with good response, probably the best middle click I’ve tested. The width of the scroll wheel is thinner compared to mice like the G703, G305 and FK2, so it does feel a little more jabby when pressing down, but not a huge deal. The height of the scroll wheel in comparison to the buttons is about standard, nothing to uncomfortable about its placement. The customizable side buttons gives a gamer great flexibility in adding the right side buttons to act as DPI shifts or other macro functions. One thing we do miss is the lack of a DPI button on the top of the mouse, this is now located at the bottom of the mouse, so a quick DPI change isn’t accessible from the top of the mouse. The stand out feature on the Logitech G Pro Wireless is the insane battery life, 60 hours with RGB off and 48 hours with RGB on. It’s an insane luxury to have a wireless mouse have this long lasting of a battery on a gaming mouse, after a full long weekend of gaming my G Pro Wireless still has 60% charge on it. The RGB on the mouse is fairly basic with one illuminated G icon, this is of course a more extravagant RGB solution would eat more battery life, I’ll happily take the more conservative approach for battery life. Of course if this ridiculous battery life isn’t enough you can buy the Logitech Powerplay mouse pad to charge this mouse wirelessly as it is compatible. Logitech has included a little holder for the usb dongle inside if you use the mouse with multiple setups, very nice to have that’s missing on the other Logitech wireless mice. This is quite an expensive mouse, while I’m sure the R&D on the sensor justifies the cost, it’s still a hard pill to swallow for a mouse that does the core fundamentals of a gaming mouse really well, it’s not as robust in features as the G903 for example which has infinite scroll, side scroll buttons and 2 DPI buttons on the top of the mouse. The Logitech G Pro Wireless is backed by a 2 year warranty. Logitech’s warranty is usually superb, my G403 scroll wheel started to act randomly and Logitech replaced the mouse with a G703 very quickly. You can buy with confidence when dealing with Logitech products. 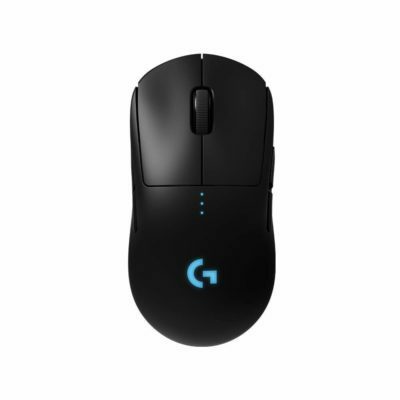 The G Pro Wireless has had early reports of the mouse buttons rubbing due to the narrow gap between buttons and some others have experience double clicking, I personally experience a little double clicking at the beginning and it has seemed to go away with use, so be sure to check for those issues if you do end up getting the G Pro Wireless. The Logitech G Pro Wireless is a great friggin mouse, I enjoy this mouse immensely and if price weren’t an object I would recommend this mouse for a lot of people. Considering that the Rival 600 serves a similar hand size and costs half of the Logitech, I’d likely recommend you spend that extra money on another part of your setup, the Rival 600 is a great mouse, so long as you don’t heavily value wireless with great battery life and super light weight. If you do care about those things a lot, or if you’re left handed, the Logitech G Pro is by far the best wireless mouse I’ve reviewed, it’s the best ambidextrous mouse and overall it’s a great gaming mouse, get this mouse if you deeply care about getting the mouse experience. Otherwise, look for a deal and snag this mouse when you can.